Casino Treasure uses Grand Virtual software which is known for its quirky graphics. On the craps game you get a split view of the table, and as the shooter you get to choose your dice and make the hand throw them! The game offers 3x odds so it’s also one of the best returns you’ll find. NB Casino Treasure does not permit players from the US. Casino Treasure runs on Grand Virtual software, who are known for great, quirky graphics. 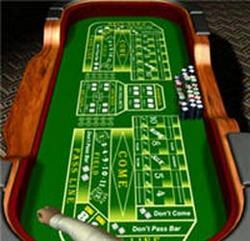 On the craps game you get a split view of the table, including one from the shooter’s point of view. You get to choose from 4 dice, and make the hand throw the dice! The maximum Odds bet is 3x the existing Line bet. Casino Treasure has download-only Grand Virtual software. You can opt for a wide range of language. English, French, German, Spanish, Chinese, Dutch, Greek, Italian, Japanese, Korean, Portuguese, Swedish, Norwegian, Danish, Hebrew languages available. 100% bonus up to $100 on your first deposit. Free draw to win a holiday in the Bahamas! Dedicated multi-lingual support specialists covering 16 major languages. Launched 1997 this is a long-standing casino. Casino Treasure is owned by Ultra Internet Media. Play in US dollars, Euros or UK Pounds. Payments via CLICK2PAY, Moneybookers, NETELLER, Visa, Visa Debit and Visa Electron, Bank Wire Transfer, MasterCard and paysafecard. Comments & Feedback on "Casino Treasure Craps Reviews"